It’s time for the science fair, and Ned has put his heart and soul into his model heart. But disaster strikes just before judging! 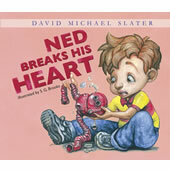 Ned is forced to think fast to mend his broken heart in time. Will this heart-stopping tale end with heartbreak or a heartwarming moment of success? NOW AVAILABLE as an interactive app/game for tablets/phones from TINY TAP (requires Tiny Tap app) Read by the author!